In many ways, the education today’s chiropractic doctor receives is comparable to what a medical practitioner receives. These days, the education that a chiropractor receives is quite similar to what medical practitioners receive. In fact, a recent study says that chiropractic and medical curricula are “more similar than dissimilar.” Some chiropractic colleges require a Bachelor’s degree before enrollment. 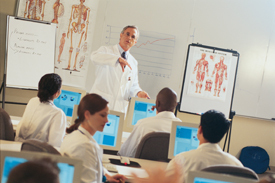 A doctor of chiropractic’s training generally requires a minimum of five years of college study. Obviously, medical doctors receive additional training in pharmacology and surgery, whereas chiropractors focus more on physiology, pathology and spinal adjusting techniques. After passing board examinations and state licensing requirements, today’s chiropractor, like all types of doctors, must attend continuing education classes for relicensure and to stay current on the latest scientific research. SOURCE: Classroom hours based on the review of curriculum catalogs from eleven chiropractic colleges and twenty-two medical schools in the United States (1996).